No longer just what Hot Topic's board of directors makes when scoping out places to take over in the mall, BodyShopBids is also a just-now-available-in-LA service that you'll definitely want to have handy (add it to My Thrillist, yo!) the next time you get in an accident -- mostly because you love being serviced, but also because it'll get you legit, local bids on auto repairs and all you have to do is take a cell pic of your car's damage. 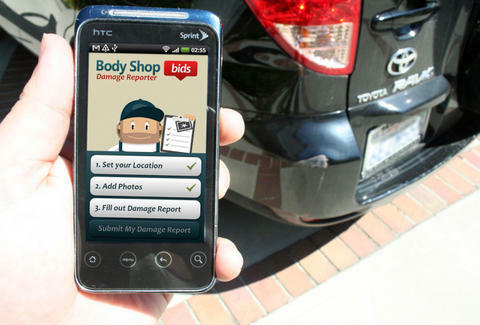 Using it's easier than Stacy's mom: when your ride gets dinged, snap a photo w/ your Zack Morris smart phone, and file a report using their website or iPhone/Android app. They'll make your info anonymous and send it to a bunch of car fixer-uppers, then you'll get four competing bids from nearby shops within 24hrs. Once you've picked a bid, they'll send your info to the shop, which'll then get in touch with you directly via your Zack Morris smart phone; all the shops are totally vetted, w/ up-to-70% discounts on repairs thanks to stuff like "extra availability" and "plans on repairing a part as opposed to replacing it" -- so, obviously, these shops aren't run by the Two and a Half Men producers. To ensure you're not getting taken for a ride (car joke! ), they have an in-house estimator who reviews each request, plus they'll also ask you for feedback once the repairs're made to ensure they're hitting you with the best spots, which, if it's not The Body Shop, HAS to be Cinnabon.